This looks like a great way to break down a palette whether one is quilting or painting. Good choices; I like yours best. Great bundle! I like that we have a fabric twin this week. Your bundle is well worked out. Love the fruit stand. Thank you, Yvonne. I'm surprised nobody else chose it! Your palette is gorgeous. It just screams sophistication to me. Fun colors! I love the bright pinks. I also love that Fruit Stand Choice. The Tula print was in my bundle originally in another colorway, but ended up not making the cut. That would have been three of us (at least) using the same print! Another great palette, Sarah. I always love your choices. Thank you, Bethany. I love that Tula print. I cut some of it in the purple color way for my purple Royalty quilt (which has been sadly neglected in favor of more urgent sewing -- I should get back to that). What a fun palette! I'm glad you stuck with the fruit stand, love it. I like how all you bundle as a little pop of white. I reminded me of how the logo on the starburst are printed in white. so it seemed like you fabric choices repeated that, connecting them to the photo more. I like it. Thanks, Steph. I had a great time using the theme of the photo as well as the color palette! 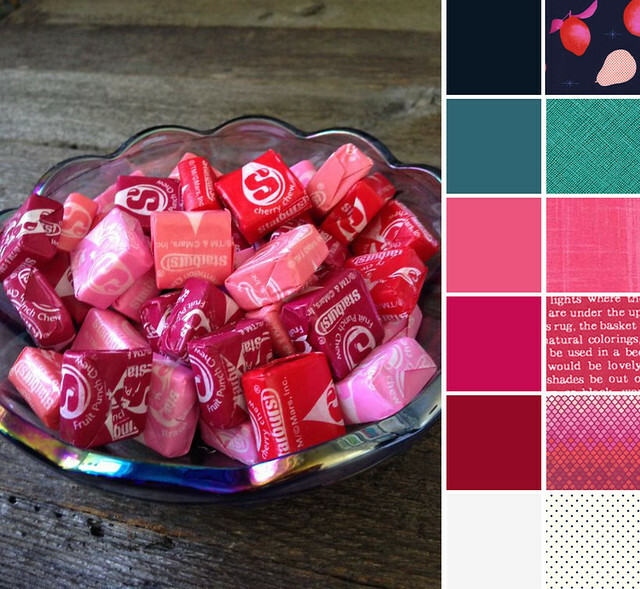 The Tula Fabric is perfect for this palette!! !